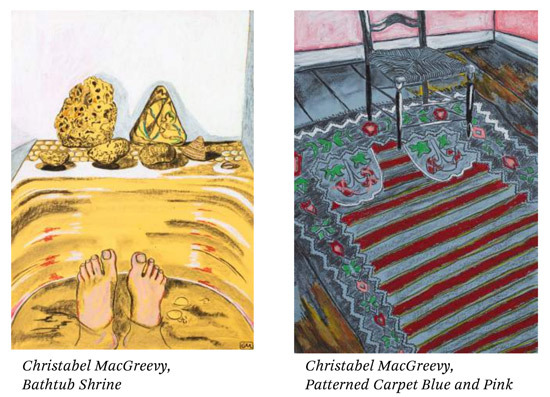 Students of the Royal Drawing School’s postgraduate programme - the Drawing Year - are having exhibitions of their work this month. An expanded show of over 300 drawings in The Drawing Year End of Year Exhibition 2016-17 at the Royal Drawing School Shoreditch 29 November 2017 to 16 January 2018. The works are by artists graduating from the School’s intensive postgraduate programme who have spent the last year exploring their practice through drawing from observation. high-quality teaching from a distinguished faculty. The scope to study for free is particularly relevant and helpful at a time of rising fees for education and the high cost of living in London. practices in illustration, animation, architecture, film and theatre design. Alice Shirley, acclaimed designer of Hermès silk scarves. Alumni have also exhibited widely in the UK and internationally, and their work is included in major collections, such as Tate, the Royal Collection, British Museum and the V&A Museum. Graduates of the most recent Drawing Year include the first ever graduate who started out on the Drawing School's Young Artists courses who has then gone on to complete The Drawing Year. Londoner Gideon Summerfield age 22 was part of the Young Artists programme between the ages of 12-17. Since then he has graduated from Cardiff School of Art and Design with a First Class Honours Degree in Illustration, and credits the School with much of his success. I first highlighted him on this blog in Drawings of Holocaust Survivors. 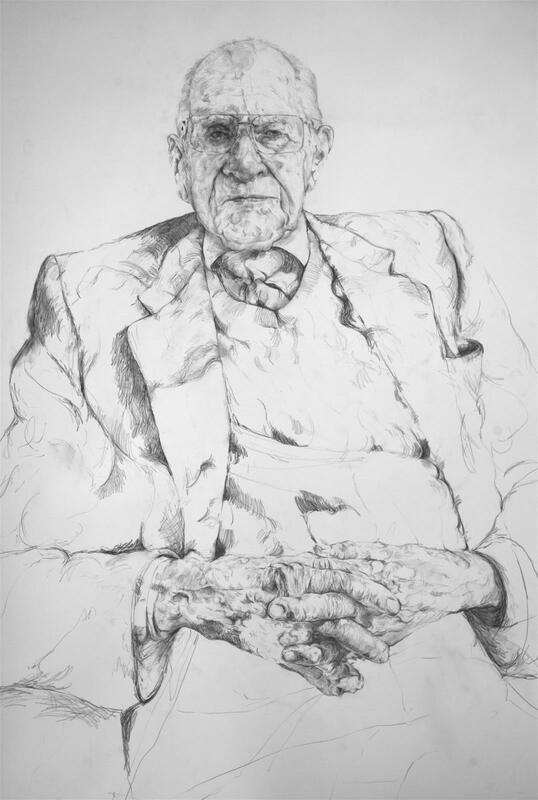 He displays two of his portraits in this exhibition, including a pencil portrait of British immunologist Dr William Frankland MBE, which won first prize in the Hermione Hammond Drawing Award 2017. 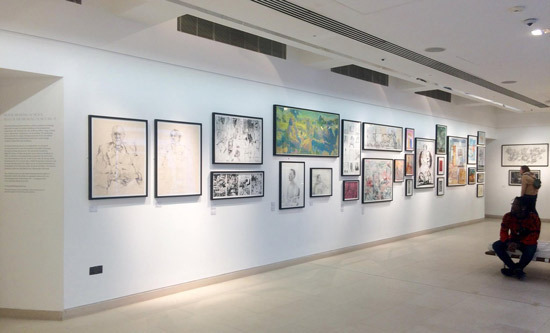 An expanded selection of his work displayed at Shoreditch, will feature his reportage illustration documenting the refugee crisis, entitled ‘Love the Stranger as Yourself, which recently captured the attention of the media including the BBC. Lee Cutter’s ink drawings of Japanese gardens symbolise the presence of harmony and balance. This metaphor of finding peace is important to Cutter – he led a difficult childhood, facing challenges in his education, a lack of support networks, and some bad decisions, which led to spending time in prison. Upon discovering drawing, it ‘gave him a new life’; he went to study fine art at university, and now works at the Koestler Trust, helping others transform their lives through the power of art. Richard Ayodeji Ikhide has used drawing to develop his textile designs into fine art. Jack Fawdry Tatham’s interest in aquatint etchings (pictured above), has led to plans to reopen the printing press under Pollock’s Toy Museum, a Victoriana museum in Fitzrovia owned by his Grandmother. All the drawings in this exhibition are for sale; prices for a small print, study, or a large-scale drawing range between £150 - £2000. The commission goes towards funding the School’s scholarship and bursaries programmes so that high-quality drawing tuition is available to all regardless of background or circumstance.